Go to any high school, college or professional football game, and at half time, you'll see a highly organized, talented group of musicians entertaining you on the field. 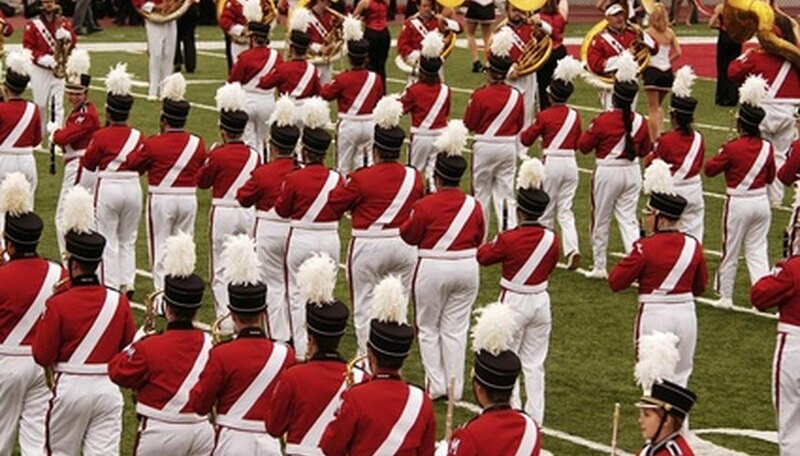 Normally, members of marching bands wear specific pants, coats, capes and hats to identify themselves as being with the band and to improve the uniform look of their formations. Marching band uniforms are often beyond the financial reach of music institutions, so grants help cover the cost. The Mockingbird Foundation is a nonprofit organization whose operations are conducted almost entirely online. The organization relies exclusively on volunteers and supports music education programs across the country. Specifically, the foundation provides grants to programs that use music to foster students' self-esteem and self-expression, especially those programs that assist disenfranchised students. The Mockingbird Foundation supports music not only through uniform purchase but also through funding field trips, buying instruments and supporting music technology. Applicants face stiff competition for these grants--only 15 are selected out of every 1,400 inquiries. Generally grants range from $50 to $5,000, but awards are dependent on the amount of donations received by the foundation. Since major operations are hosted online, information is available at mockingbirdfoundation.org. The Target Corp. has launched a program directed at the arts, including music education programs. It provides Target Arts in Education grants to nonprofit organizations and schools to make it affordable for students to learn music as part of a cultural experience. The money is not eligible for regular instructional programs, but money for uniforms could be obtained from the organization as part of an outreach and arts program. For example, a youth center may apply for uniform funding in a music program for low-income or underprivileged youth that has the goals of using music to teach community encouragement and pride, teamwork and discipline. These grants are specific to the Minneapolis-St. Paul, Minn., area and can only be applied for online at sites.target.com. The Prescott Pops Symphony, based in Arizona, seeks to give back to the community by supporting music among youth. The symphony provides grants that fund all kinds of instrumental programs. Monies are allotted for uniforms, but the grants also are awarded for instruments and music. The grants are given to intermediate or secondary schools in the Prescott area only. As of 2010, the symphony has given approximately $20,000 in grants.